That, in fact, is the big question. Why would anyone want anything but the absolute best service and highest up-time for their customers and themselves? The answer is expense. It’s expensive to build a Tier IV-quality (fault tolerant) data center. But, why should anything less than Tiers III or IV exist these days? None of the technologies are new nor are the components that comprise those data centers. The Uptime Institute (TUI) developed data center tier classification and certification to “…consistently describe the site-level infrastructure required to sustain data center operations, not the characteristics of individual systems or subsystems.” This standard was built from the need to consistently discuss data center topology. TUI’s tiering classification is based on the weakest subsystem that impacts the site’s operation. To illustrate this point, refer to TUI’s Tier definitions chart below and consider TUI’s classic example of a site that combines a Tier IV UPS configuration with a Tier II chilled water system. The resulting Tier classification for the site would be Tier II, not Tier IV. Tier 1: A single path for power and cooling distribution, no redundant components, provides 99.671% availability. Tier II: A single path for power and cooling distribution, with redundant components, provides 99.75% availability. Tier III: Multiple active power and cooling distribution paths, but only one path active, has redundant components, and concurrently maintainable, provides 99.98% availability. Tier IV: Multiple active power and cooling distribution paths, redundant components, and is fault tolerant, proves 99.99% availability. All four tiers sound excellent on the surface, especially when you’re looking at availability over 99% availability for each tier. But what if you translate those percentages into numbers that you can understand more clearly? 24 hours/day x 365 days/year = 8760 hours/year. Tier I: 99.67% availability = 28.8 hours downtime/year. Tier II: 99.75% = 22.0 hours downtime/year. Tier II: 99.98% = 1.6 hours downtime/year. Tier IV: 99.99% = 0.8 hours (48 minutes) downtime/year. The availability numbers are based on data center design, equipment failure rates and experience. The number of hours shown above are for durations of unplanned outages that have been annualized for convenience. Note the significant outage difference between 28.8 hours for a Tier I data center and 48 minutes for a Tier IV data center. These are not IT Service Level Agreement SLA numbers; they are facility site outage numbers based on data center design, redundancy and maintenance schedules. To be more explicit, these availability numbers have to do with the facility itself, not the computing infrastructure held within its walls. How do the availability numbers relate to your IT infrastructure? Do they translate into a guaranteed outage if you place your services into a Tier I data center? Yes. Do they translate into a guaranteed non-outage if you place those services into a Tier IV data center? Generally, yes. But, realize that even a Tier IV data center might still experience a significant outage. Tier IV means that the site isn’t susceptible to disruption from any single unplanned event or from any planned work activities. However, you can’t rule out multiple failures that will affect a large portion or the entire data center’s availability. But, your chances of such a failure are very slim in a Tier IV facility, whereas, your chances of a single failure taking out a Tier I facility are very high by comparison. The takeaway from this analysis is this: Purchase the best affordable data center tier for your business and for your customers. Tiers III and IV are your best bet for guaranteed uptime. Tiers I and II should be reserved for disaster recovery (DR) sites, non-mission critical services or shoestring start up ventures. As old technology falls away, data center tiering will obsolete itself as well. The reason that tiering will become obsolete is that there are no affordable technology outages. 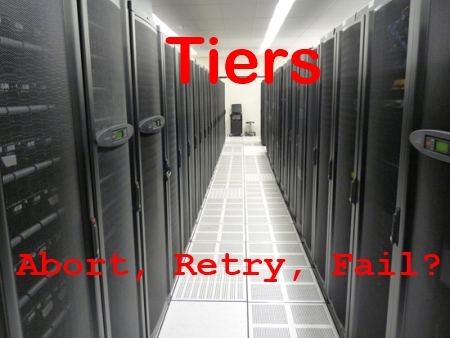 Every data center should be Tier III or Tier IV level and be available at a competitive price point.